Udaipur: “Zinda Hoon Mai – Break the routine and discover new sides of yourself. 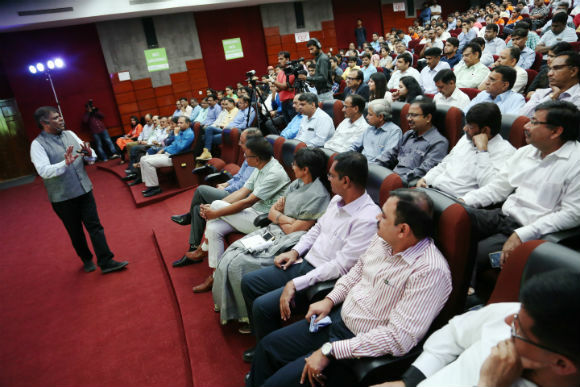 Don’t try to be like someone…Be an amazing version of the unique you”, said Vidyarthi during his interaction with employees of Hindustan Zinc on 22nd September 2017 at Hindustan Zinc auditorium. Ashish Vidyarthi was in Udaipur to deliver a lecture under the initiative launched by Hindustan Zinc – “An Insight”. A versatile actor who has done more than 200 films in 12 languages has a unique style of presentation that made the entire 300 audience present in the Hindustan Zinc auditorium in Udaipur spellbound. The art of interaction clubbed with change of expressions and body language made the interaction even more interesting and communicative. During his interaction Ashish Vidyarthi emphasized on not being afraid to make mistakes because mistakes help to learn and discover new aspects about oneself. His humorous anecdotes encouraged to look at the positive side of life and be grateful for what one has achieved. Vidyarthi pointed out that we should own this life and cherish the present. There were many occasions when the participants realised how daily routine of their life is impacting their happiness. “One has to believe that he is alive and has a purpose of being in this life”, he said. The interaction was also webcast to reach out to all employees of Hindustan Zinc and also webcast live on Facebook page of the company. Ashish Vidyarthi is winner of National Film Award, Filmfare Award and Star Screen Award. He is also the Founder of a company Avid Miner, an enterprise that engages corporates and organizations with out of the box interactive modules.